Maidenhead Aquatics at Scotsdale specialises in the outdoor water garden including a large selection of koi and pond fish as well as specialist equipment for both 'Water Entertainment' and larger stocked ponds. A comprehensive range of treatments, foods and equipment is stocked all year round. We also aim to cater to all the needs of the Tropical and coldwater Aquarist. 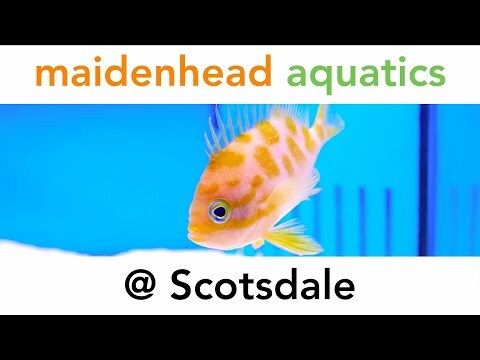 With over 150 tanks we carry a good and varied selection of Tropical Fish including many tepid water species and African Rift Valley cichlids. Our main display piece being an awe inspiring 10’ tank with a wide selection of Rift Valley Cichlids. We have recently increased our offering of fish more suitable for the 'Nano' style aquarium, with pairs of 'Fancy Fighters' such as the Half Moon, Crown Tail and Plakat Half Moon. Varying colours are available and more are available to order on a weekly basis. This section will be continuously changing to reflect what we have available to us so please let us know if you are looking for anything in particular. We will endeavor to get any products or fish that you may be looking for, pop in for a chat and we'll see what we can do for you.